Butternut squash fries you and your kids will love! 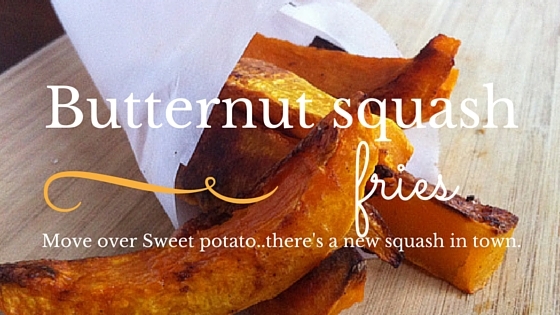 Move over sweet potato…there’s a new squash in town! Is there anyone who doesn’t like French Fries? No one can resist a good, crisp, fresh, hot, salty french fry. My love affair with fries means I just can’t get enough of the finger-licking potato delight. These aren’t just any old french fries, they’re butternut squash fries. This is a great way to Satisfy your cravings! These guys taste so much like sweet potato that you may hardly be able to tell the difference. Which is not a bad thing, since sweet potatoes are delicious and healthier for you! Even potato-avoiders don’t have to give up this indulgence and on a side note… they are ridiculously quick and easy to make. Peel the squash with a vegetable peeler. Cut the squash in half where the long section meets the bulb- like section. Cut the bulb-like section in half and scrape out the seeds. Cut all the squash into 1/2" thick fries. Place the cut fries in a large plastic bag with the oil , garlic salt, and pepper. Seal the bag and massage it with your hands to coat the fries well. Cook for 30- 40 minutes, turn fries over and cook for another 20 minutes or until golden brown. If you want to spice things up you can use chipotle chile powder for a spicy smoky flavour OR Chinese 5 spice powder for a sweet flavour. What a great recipe. Squash is a veggie more people need to try and enjoy. no way, I didn’t know you could do this. I def. want to try it. Butternut squash is my fave. We need to try these. They look and sound absolutely delicious! What a great idea for a fry! We love squash, and are always looking for new recipes to try! Terrific post! What a great idea! I make sweet potato fries, but I’ve never even thought to make fries out of squash! I’ve done this with sweet potatos, but not butternut squash! I’ll have to try it! YUM! I would love to make these fries. Those look delicious. 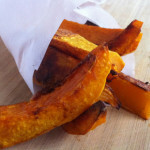 My kids would not eat sweet potato fries when I tried but maybe they will eat these, i will have to give them a try! Oh YUM!!! I’ve made sweet potato fries and carrot fries but never butternut squash fries. I can’t wait to make a batch of these. They look and sound fabulous! I’ll def have to try these. i’m eating low car and I miss my fries. I really really do. Yum! Those sound like a great compromise into a healthier lifestyle. Plus, butternut squash seems like the perfect fall veggie. Oh this would be super fun to try for myself. I know my daughter and I love butternut squash so this could be good for a girls night in. These look really interesting and I’m intrigued! I’m sure they taste great and would love to give them a try! I hate to admit it, but I have never eaten butternut squash. Maybe this could be my first recipe? I think this a is a great way to start. You’ll be picking up another squash in no time! My daughter made butternut squash fries last year! They were really good. I like them possibly better than sweet potato fries. I love making butternut squash. Never though to make fries! We had roasted butternut squash last night. Must try it this way as we love squash. That’s awesome! I love butternut squash and I love fries, but they’re not very healthy normally. This is awesome. Ooooh these look good! I had some at a Mexican restaurant last night and was thinking about how to steal the recipe… no need now! Never made fries from a butternut squash, but I bet it tastes delicious.